Last Saturday night was a difficult night in many ways for Kerry Supporters. The weather was dreadful and unfortunately the scoreboard wasn’t on our side at the final whistle. Great credit is due to the brilliant supporters who braved the elements and were very vocal in their support of the team. Great credit must also go to both teams who battled hard in torrential rain. Mayo were the better team on the night and our performance was a little on the ‘flat’ side. Peter Keane and his team have had a very successful league campaign and this loss will serve as a great learning experience for the team as a whole. Peter Keane’s focus from the start was the try out lots of players and build a team for the Championship, if we make the final then we are in bonus territory. The pitch was in brilliant condition last Saturday night and huge thanks is due to Groundsman Ger O’Mahony and the Austin Stack Park Committee. Not only had they the grounds in great condition, they also, for the second time this League, put on a marvellous pre match show. Liam O’Connor yet again had the crowd and some stewards dancing and singing! 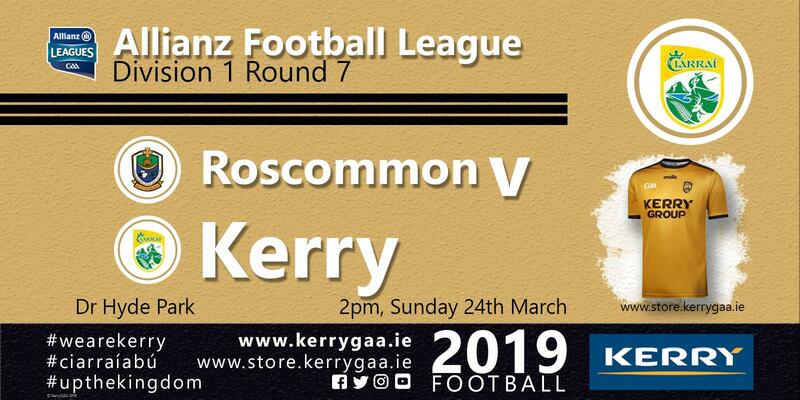 Our final round game is an away fixture to Roscommon on Sunday at 2pm. A win or a draw is enough to guarantee a place in the Final the following weekend. Galway, Mayo and Tyrone are also all potential finalists. So it is all to play for next Sunday! The team will be announced at 8pm on Friday night on the Kerry GAA website.